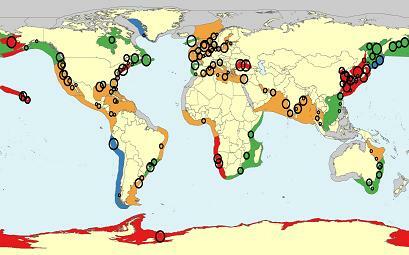 Map of population trends of native and invasive species of jellyfish by LME. Jellyfish are increasing in the majority of the world’s coastal ecosystems, according to the first global study of jellyfish abundance by University of British Columbia researchers. In a study published in this month’s edition of the journal Hydrobiologia, UBC scientists examined data for numerous species of jellyfish for 45 of the world’s 66 Large Marine Ecosystems. They found increasing jellyfish populations in 62 per cent of the regions analyzed, including East Asia, the Black Sea, the Mediterranean, the Northeast U.S. Shelf, Hawaii, and Antarctica. “There has been anecdotal evidence that jellyfish were on the rise in recent decades, but there hasn’t been a global study that gathered together all the existing data until now,” says Lucas Brotz, a PhD student with the Sea Around Us Project at UBC and lead author of the study. To read the rest of this article, click the link provided here: http://www.publicaffairs.ubc.ca/2012/04/18/jellyfish-on-the-rise-ubc-study/. You can read now the full report in cIRcle, UBC’s Digital Repository in the Fisheries Centre Research Reports collection at: https://circle.ubc.ca/handle/2429/37052. And take a moment browse through this growing collection found at: http://hdl.handle.net/2429/41821. Three members of UBC’s Fisheries Centre won the UBC Library’s Innovative Dissemination of Research Award in 2012 for The Sea Around Us portal. To find out who they were and to learn more about this award for new and innovative ways of communicating and disseminating knowledge, visit the Scholarly Communications @ UBC website at: http://scholcomm.ubc.ca/events-awards/award/. Above partial excerpt in italics and image are courtesy of the UBC Public Affairs website at The University of British Columbia.